Northwest National Real Estate: Sale Pending! Motivated Sellers/New Home! Sale Pending! Motivated Sellers/New Home! Custom built home on the Clark Fork River and end of the road privacy on the Trestle Creek Golf Course. Lots of wildlife in this area. 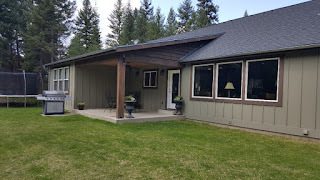 You can watch bear, deer, elk, moose and bald eagles from your back yard covered patio. Inside of the home has stainless steel appliances, island in the kitchen for extra space, extra bonus family room and an office. Barn wood accents and barn doors separate the family room and office. Open living space. Outside is on the Clark Fork River with a fishing hole out your back door. Home is located in Western Montana with easy I-90 access to Missoula, MT or Spokane, WA. Lots of recreational opportunities in this friendly Western Montana community. Priced at $319,000.